A fan of online poker was celebrating on Monday afternoon after they hit the progressive jackpot playing Poker Ride and won £175,566. One lucky poker fan was dealt the right cards to hit the progressive jackpot playing Poker Ride and won £175,566. 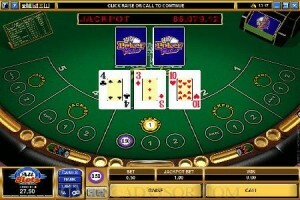 Poker Ride is a popular casino poker game from Microgaming. Like all video poker games the idea is to build the best five card poker hand possible. Players need to place an initial “ante” and can place bets after the first and second rounds of play. However, in order to qualify for the progressive jackpot players need to place a bet of fixed value before each hand. It is this fixed bet of one unit that goes to the progressive jackpot pool. Poker Ride frequently pays out vast sums as portions of the jackpot are won almost every week. This is because a straight flush wins 10% of the progressive jackpot. However, to win the full jackpot players need a royal flush and this is slightly rarer. Nonetheless the jackpot is hit once or twice a month and normally pays out over £150,000. In the past it has even been known to payout as much as £325,000. The jackpot is already growing again and in the past it has been hit twice in a week so if you enjoy video poker and are after a large win then be sure to check it out.